The Gospels of Matthew, Luke, and John tell us everything we know about Joseph, the husband of Jesus’ mother, Mary. But the importance of Joseph’s part in God’s plan is first found in the Book of Isaiah in the Old Testament. Through the prophet Isaiah, God promises to send a Messiah to save all people. The Savior will come from the 'house of David,' which means that he will be an ancestor of King David. Both Matthew and Luke Gospels tell us that Joseph was from the family of David. The Gospels tell us that Joseph was a 'just' man. That means that he was faithful. He was faithful to God and said yes to God’s plan for him to be Mary’s husband and Jesus’ foster father. He was faithful to Mary; caring for her while they waited for her baby to be born. He was faithful to Jesus, protecting him when he learned of King Herod’s plan to kill him and, when the danger passed, helping Mary to raise Jesus with love in the small town of Nazareth. 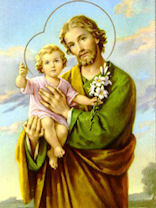 We honour Joseph’s faithfulness to God, Mary, and Jesus on 19th March each year. We pray that we, too, can be obedient to God’s plan for us. Some people do good no matter what happens to them. Martin de Porres did. His mother was an African or Indian from Panama, a former slave. His father was a Spanish soldier and nobleman. So people made fun of Martin because he came from two different races. What did Martin do? He blessed his enemies; he did good to those who laughed at him. Was this easy? No. But Martin simply loved to do good. Martin was born in Lima, Peru, in 1579. His father left his family when Martin was eight. This left Martin and his baby sister and their mother very poor. But Martin still gave away whatever he could to other hungry and poor people. When he was 12, Martin went to work for a barber. He learned to cut hair and to heal wounds. Later, Martin wanted to join the Dominicans in their work. He was allowed to work with them as a servant who swept floors and answered the door (at the time, the law in Peru did not allow persons of other races or mixed race to enter religious life). Finally his years of good works and miraculous cures led the Dominicans to allow him to become a lay brother, but even some of his fellow Dominicans still scorned him. He eventually founded orphanages for homeless children and cared for lonely African slaves who had been forced to come to Lima. He gave shirts to those who had no clothes; bread to those who had no food; shelter to those who had no homes. One of his closest friends was St. Rose of Lima. In 1639, Martin died. Everyone in Lima mourned him, even bishops and members of the royal court in Lima. 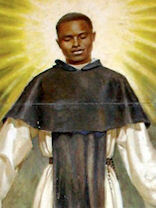 In 1962, the Church declared that Martin de Porres was a saint. Many statues of St. Martin de Porres show him holding a broom, with a dog, cat, and mouse at his feet; he loved animals and was said to have solved a rat problem by simply asking the rats to leave. The house where he was born has been well preserved in Lima. He is the patron saint of persons of mixed race and of those who suffer from discrimination. Theresa was born in Normandy, France in 1873. She had four older sisters and her parents were Louis and Zelie Martin. Theresa was a very lively, lovable little girl and her father called her his 'little queen'. Yet she could also be too sensitive and irritable. In the story she wrote of her life, she tells how the Infant Jesus helped her overcome this weakness. Theresa wanted very much to enter the Carmelite convent where two of her sisters were already nuns. But since she was only fifteen, they did not let her. Theresa felt sure that Jesus wanted her to spend her life loving him alone. She kept praying and asking the superior to let her join the convent. She even dared to ask Pope Leo XIII himself to grant her heart's desire and finally she was allowed to enter. Although she was only fifteen, Theresa did not expect to be treated like a child. 'Obedience, prayer and sacrifice' were her duty. She had a thirst to suffer for love of God. Theresa had the spiritual courage of a real heroine. "May Jesus make me a martyr of the heart or of the body-or better, both!" she wrote. And she meant it. In winter she suffered from the bitter cold and dampness of her plain bedroom. There were other kinds of sufferings, too. Whenever she was made fun of or insulted, she would offer her pain to her beloved Jesus. She would hide her hurts under a smile. Sister Theresa tried hard to be humble. She called her great belief in God her 'little way' to holiness. She always had a burning desire to become a saint. She said, "What matters in life is not great deeds, but great love" and she attended to everyone and everything with great love. She is popularly known as 'The Little Flower of Jesus' because she said she was just like the simply wild flowers in forests and fields, unnoticed by the greater population, yet growing and giving glory to God. She died aged 24 in 1897 with these words on her lips, "My God I love you! She was canonised in 1925 and the rose is her signature. 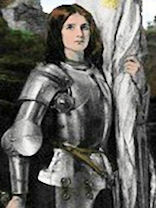 In May of 1429, a young woman clad in white armor rode her horse onto the battlefield at Orleans. Behind her marched hundreds of French soldiers. Following her battle cry, they defeated the English and won great victories for France during the Hundred Years’ War. Jeanne d’Arc was only 17 years old when she won that battle. She fought to bring peace to her country. For nearly 100 years, the French and the English had been fighting. The French farmers and their families suffered greatly. English soldiers burned their fields and crops, and many people died of hunger. Jeanne, or Joan as she is best known outside of France, had been born to one of these poor farm families in 1412. At the age of 13, she began hearing the voices of Saints: Michael, Catherine, and Margaret. They encouraged her to help the French farmers. So at age 16, Joan left the farm and went to the palace of the French prince. She asked to lead his army. After she won the battle of Orleans, Joan led her soldiers to other victories. She was wounded several times. She was eventually captured by the enemy, and the English then purchased her as a prisoner and put her on trial. The English found Joan guilty of lying about the voices she heard. On May 30, 1431, they burned Joan to death. She was only 19 years old. But 25 years later, the Church found her innocent of all crime. In 1920, the Church said that she was a true saint who had fought for what she believed. She is sometimes called the “Maid of Orleans” and is the patron saint of France. Raymund Kolbe was born in Poland in 1894. His family was very poor, but they were rich in spirit. In 1914, his father was captured and killed by the Russians for fighting for Polish independence. Young Raymund had a great faith and strong devotion to Our Lady. He went to school to be a Franciscan priest and was ordained in 1918, taking the name Maximilian Maria. After studying in Rome, Maximilian returned to Poland in 1919. He used modern printing presses to spread the Good News through monthly, and eventually daily, religious publications. He also spent six years as a missionary in Japan. During World War II, Father Kolbe hid as many as 2,000 Jewish people and Poles, who were also persecuted, in his Polish monastery. In 1941, Maximilian was arrested by the Nazis, who soon sent him to Auschwitz concentration camp. This was a terrible place where the Nazis killed many people. In July of that year, several prisoners escaped, and as punishment, the camp commander picked 10 men to be starved to death. Franciszek Gajowniczek, a husband and father, was one of these sentenced to death. Father Maximilian Kolbe offered his life in the man's place. Each day, he celebrated Mass for the other starving prisoners and prayed and sang with them. When he outlived many of the other men, he was killed by lethal injection. On October 10, 1982, Pope John Paul II canonized Maximilian Kolbe as a 'martyr of charity'. Present at the ceremony was Franciszek Gajowniczek, the Auschwitz prisoner whose place Maximilian had taken in giving his own life. 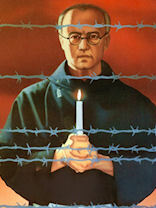 Gajowniczek lived for 54 years after St. Maximilian Kolbe had taken his place in death. Some people have called Pier, or Peter, Frassati a saint for today’s young people. He was handsome and athletic. He hiked, climbed mountains, rode horses, and skied with his many friends. He loved to laugh, and he was famous for his practical jokes. He loved life and lived it to the fullest. Pier was born in Turin, Italy, in 1901. His mother was an artist and his father founded and ran the Italian newspaper La Stampa. As he was growing up, Pier developed two habits that became part of his everyday life. He went to Mass daily to receive the Eucharist, and he also prayed the Rosary. He never hesitated to share his faith with others. Pier had a great concern for the poor, even as a child. One day a needy mother with a young son came to the Frassati home to beg for food. Pier noticed that the child was barefoot. He took off his own shoes and gave them to the boy, and then he and his mother fed the poor family. Pier used the money he got as a graduation gift to rent a room for a woman who had been evicted from her apartment because she had no money. He gave away his allowance to the poor, and sometime he chose to walk home from school because he gave the money for his bus or train fare to someone in need. He joined the St. Vincent de Paul Society as a young man and spent hours on activities that helped the poor and sick. As a mining engineer, he cared deeply about the rights of the miners. He wanted them to have just working conditions and fair wages. When he was 24, Pier became very ill with polio. Some people said he got this disease from caring for people in the slums of Turin, but Pier saw Jesus in the people he served. In his last days, he whispered the names of people who still needed assistance to his family and friends who gathered at his bedside. He died on July 4, 1925. Peter was declared 'Blessed' in 1990 by Pope John Paul II, who called him a 'man of the Beatitudes' and a 'joyful apostle of Christ.' 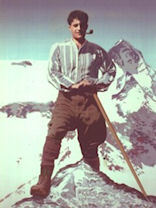 Many people were surprised that the Vatican created an official portrait of him for his beatification that showed him outdoors, leaning on an ice axe, with one foot on a rock, in honour of his youthful vitality and his love of the mountains. "It is an act of justice for the rich to help the poor." An Italian official, Callisto Legnani, bought Bakhita. For the first time since she had been kidnapped, she was treated with care, rather than being beaten. When the time came for the Italian consul to return to Italy, he brought Bakhita with him. Once there, Legnani left Bakhita with Augusto Michieli and his wife. When the Michieli’s daughter, Mimmina, was born, Bakhita became her caretaker and friend. 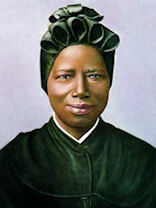 On December 8, 1896, Josephine Bakhita became a Sister at the convent and committed her life to God forever. For the next 50 years, she served the Schio convent community by cooking, sewing, and attending to the door. When she was on duty at the door, her friendly, sweet voice was pleasing to children, comforting to the poor, and encouraging to others. As she grew older, Mother Bakhita suffered greatly in sickness. 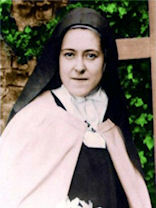 She died on February 8, 1947, at the Canossian convent in Schio, surrounded by the other Sisters. She was named a saint of the Church on October 1, 2000, by Pope John Paul II.